Dr McCulloch's research interests are computational methods for quantum many-body systems, specifically using Tensor Network methods. Dr McCulloch has made significant contributions to the field, especially in the realm of the one-dimensional version of Tensor Networks known as Matrix Product States (MPS). Dr McCulloch has 20 years of experience in developing sophisticated, high performance computational software and tools, and applying them to open problems in condensed matter and quantum physics. Tensor Networks provide a theoretical framework that captures the important properties of quantum systems (such as entanglement) in a way that also allows use of algebraic properties such as geometric and internal symmetries. The result is a framework for computational methods that combines powerful algebraic methods with efficient numerical techniques that can make good use of modern computational architectures (such as GPU devices) to give tools for modelling many-body quantum systems at a microscopic level. These tools have many applications, from fundamental physics such as the classification of topological states of matter, to applications in real materials and devices, such as ultra-cold atomic gases, and quantum-engineered devices. MPS methods are a key tool for the characterization and simulation of topological states of matter, bridging the gulf between 'toy' models that are exactly solvable, versus real materials that have complicated interactions and cannot be solved analytically. Analysing the properties of candidate models that exhibit topological order is a key area where computational methods are having a big impact, bridging this gulf between theoretical models and experimentally realizable materials. A specific example is models of frustrated magnetism, which have been shown using computational methods to realize exotic topological phases that have otherwise only been predicted in simplified (and unphysical) toy models. While the statistical mechanics of the thermal equilibrium state has been well understood for many years now, a key question is how thermal states arise at the level of microscopic dynamics. Computational methods are a key tool to uncover the mechanisms of thermalisation at the quantum level. The idea behind quantum simulation is to produce a device that is hard-coded to solving some specific problem that is difficult to solve on a classical computer. Computational methods play a key role in the development of quantum simulation, to validate experimental apparatus, and to provide a framework for classical computation that a truly quantum device should be able to surpass. If we can simulate it using a classical computer, your device isn't really "quantum"! 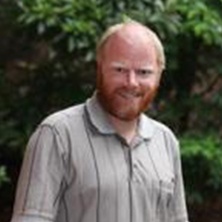 Dr McCulloch has made many significant contributions to the development of numerical algorithms based on Tensor Networks, particularly the one-dimensional version known as the Density Matrix Renormalization Group (DMRG), and Matrix Product States (MPS). He has more than 20 years of experience in developing sophisticated, high performance computational software and tools, and applying them to open problems in condensed matter and quantum physics. He is the author of several papers as first or sole author which are now standard references in the field, with key contributions in how to incorporate symmetries into tensor networks, and new algorithms for excited states, translationally invariant systems, and frequency-space methods. Recent research themes include searching for candidate models of topologically ordered materials, non-equilibrium dynamics and thermalization, and quantum simulation. Simulating quantum states of matter: connecting theory to applications in science and technology. Tensor Networks provide a representation of a quantum many-body wave-function (or a classical partition function) that is suitable for computational methods, mainly for low-dimensional problems (1D and 2D). The most mature branch of tensor networks is known as Matrix Product States (MPS), often called DMRG. These days this is the widely used method to solve 1-dimensional quantum many-body problems. At UQ, we have developed the Matrix Product Toolkit, which is a comprehensive software toolkit for many kinds of MPS-based computations, including ground-states, real-time dynamics, and thermal and dissipative states. This software toolbox has been used in approximately 70 research publications in various fields of condensed matter and quantum science, ranging from ultra-cold atoms in optical lattices, ion traps, Josephson Junction arrays, strongly correlated systems, frustrated magnetism, topological order, dynamical mean-field theory. See my publications at ResearcherID for more details. I am happy to talk to you to find a suitable project at any level, from summer project to PhD. Possible short projects would be, for example, learning about the Matrix Product Toolkit and trying some calculations (depending on the details and rate of progress this could lead to a research publication), or implementing a simple MPS or tensor network algorithm in Python or Matlab. Continued development of the Matrix Product Toolkit (new algorithms, or optimizing existing algorithms). The toolkit is written in C++, so experience in modern C++ highly desirable. Development of new Tensor Network algorithms outside the current scope of the Toolkit, eg PEPS, MERA, ... Good computational skills required, not necessarily in C++. Applications of the Toolkit to any relevant area, either continuing existing research streams or new applications (aside from the above, there are possible applications in neural networks and deep learning, compression algorithms, quantum chemistry, nuclear physics, lattice gauge theory). Comment on "phase separation in a two-species Bose mixture"
Comment on "Equivalence of the variational matrix product method and the density matrix renormalization group applied to spin chains" by J. Dukelsky et al. Ferris, Andy, Davis, Matthew and McCulloch, Ian (2009). Simulating Bose gases with tensor product states. In: ACOLS ACOFT. ACOLS ACOFT 09, The University of Adelaide, (266-267). 29/11/09 - 3/12/09. McCulloch, IP and Gulacsi, M (2000). Density matrix renormalisation group method and symmetries of the Hamiltonian. In: Australian Journal of Physics. 9th Gordon Godfrey Workshop on Condensed Matter Physics, Sydney Australia, (597-612). Nov 08, 1999. Classical and quantum anisotropic Heisenberg antiferrogmagnets (2009) . Edited by Ihor Tukhnovskii. The 3rd conference on statistical physics dedicated to the 100th anniversary of Mykola Bogolyubov, 23-25 June 2009, Lviv, Ukraine.